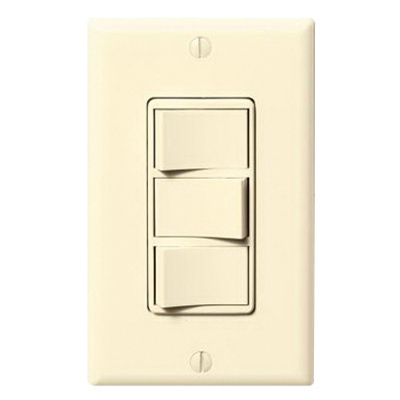 Panasonic ecoswitch 3-Function whisper control switch in light almond color, lets you control current, LED lighting and DC motor loads efficiently. The decorator styling, wall-mountable switch provides multiple controls in a 1-Gang wall box. This 1-Pole switch with rocker actuator and ON/OFF action, has a voltage rating of 120-Volts and current rating of 15-Amps. The commercial grade switch comes with a matching wallplate. It is suitable for fan, light and nightlight. Whisper control wall switch meets UL, cULus and CSA standards.